A global company that specializes in industrial cooling systems and radiators opened a new facility , in Houston, last year. Being new to this marketplace, they needed to outperform the competition with faster leadtimes for their cooling systems. 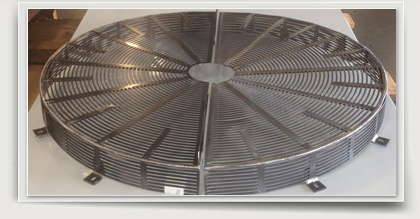 PEC Laser fabricates the majority of the metal components for these industrial cooling systems. The fabrication of the guard for the rotating equipment and protection of the coil area posed a challenge due to the tight production schedule. Typically, these guards are constructed with industrial sized wire within a frame. Since these are all custom sized frames, purchasing the wire, fabricating a fixture for the frame, and welding absorbed too much time. We proposed to LASER CUT this guard in our machines, and avoid purchasing the wire. Since these units are all custom designed by our client, purchasing a small amount of wire for a single unit is costly. PEC Laser offered a design that would simulate a guard and save the customer time. The design was approved , and our laser machines and rolling equipment ( along with our certified welders) fabricated the guards in a few days. We continue to work with our client, and they continue to have success in Houston.